-- Select a Size -- 6-10" 10-16" - Out of Stock! 14-20" 18-26" - Out of Stock! 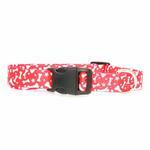 Give your pup a fashionable, durable, and fun look with our Casual Canine Pooch Pattern Dog Collar in Red with Bones. 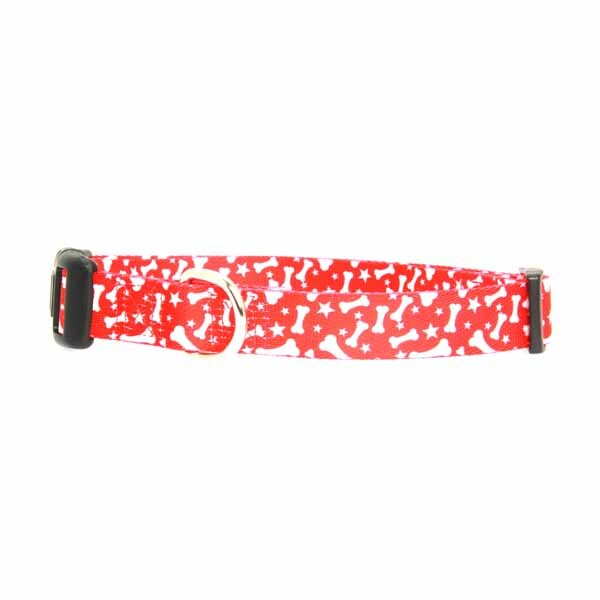 Bright colors and classic patterns come together for a fabulous look in this Casual Canine Pooch Pattern Dog Collar in Blue with Bones. The nylon is strong and durable, making these collars not only stylish but practical as well. 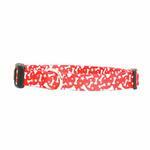 The white bones and star pattern on a bold red background also feature a black plastic buckle and a nickel-plated D-ring. Matching leashes and accessories sold separately. Posted On 11/10/16 by Kathy H from Janesville, WI Yes, Kathy H recommends this product! This red bone collar is very cute, well made, and the color is a nice vibrant red!! I bought the 10-16" as my little girls neck measures 10"...as a result the collar is, of course, wider and there is a lot of extra slack and this collar doesn't come with a little slide to hold the extra together. Being new, the fabric is still a little stiff, but is already softening and laying better on her neck! I'm thinking In the future I'll go with a collar not quite as wide and a size down!! Just my opinion, as the collar we have is working well!!! Thanks Baxterboo !!! Posted On 07/09/15 by Melinda F from Batesville, IN Yes, Melinda F recommends this product! Sometimes it's hard to find lightweight flexible collars for little furbabies. You have a great selection and this collar is no exception! Great colorful collar. Sturdy with a nice clasp. Super easy shopping and checkout! !